Scottish Legal News can reveal that the the Duke of Buccleuch’s proposed annual £10 charge, to be levied on walkers and joggers accessing his Dalkeith Country Park at certain times from March 21, may be illegal. Midlothian Council said the move was believed to be lawful under the Land Reform Act (Scotland) 2003, which provides that a landowner can charge if they did so for 90 days per year before the act came into force. However, it may be that the estate only has authority to charge for access over the Midlothian section of the estate, where there was a subsisting charge, and not the East Lothian section. Dr Jill Robbie, lecturer in private law at the University of Glasgow, told Scottish Legal News that if gates at one side of the park had always been open to the public without charge then the subsection would not be satisfied – meaning the estate could not lawfully charge people to enter the park from any entrance. -Under s.6(1)(f) of the Land Reform (Scotland) Act 2003, land excluded from access rights includes land to which members of the public were admitted only on payment for not fewer than 90 days in the year ending on 31st January 2001 and, after that date, to which members of the public were admitted only on payment for not fewer than 90 days in each subsequent year beginning 1st February 2001, she said. -If, historically, the gates to one side of the Dalkeith Country Park were left open and members of the public were allowed to enter without incurring a charge, this would suggest that the requirements of s.6(1)(f) have not been met. -In these circumstances, the park would not be land excluded from access rights for the purposes of the Land Reform (Scotland) Act 2003 under this particular section. Adding to the uncertainty of imposing a charge, a source who was present at meetings involving East Lothian Council outdoor access officers and the estate manager told Scottish Legal News that the estate manager admitted a charge in the East Lothian section may not be enforceable and that, if pushed, he would construct a barrier between the East Lothian and Midlothian sections of the estate. However, a spokesman for Buccleuch set out the reasons for the charge and the justification for levying it by citing exactly the same provision as Dr Robbie. He said: “There is a long and continuing history of significant vandalism and illegal behaviour within Dalkeith Country Park, and under the terms of the 2003 Land Reform Act the only way we are able to close the gates and ask irresponsible visitors to leave is through continuing to levy a nominal access charge – something the park has done for many years. This will not restrict access to responsible visitors and the charges in place are exactly the same as in previous years. “Anyone with an annual pass card will continue to be able to enter the park day or night, year round. An annual adult card, for example, costs £10, or less than 3 pence per day. More than 200 cards have been sold already, demonstrating widespread local support. THE Buccleuch family, owners of more than 240,000 acres of private land, use a shadowy Cayman Islands firm to control and sell land, it has emerged. The aristocratic estate run by Richard Scott, the 10th Duke of Buccleuch, confirmed that an offshore ownership group, Pentland Limited, acts as an offshore contact to the family’s vast land business empire. The use of the Cayman Islands tax haven, revealed following research by land reform campaigner Andy Wightman, has reignited calls for greater action on the use of complex legal mechanisms to obscure the ownership of Scotland’s land. Scott, inheritor of the Buccleuch dynasty of 1663, is a director of Pentland, which has a variety of shared financial transactions with firms within the Buccleuch group, where Scott is also a director. Buccleuch lawyers Anderson Strathern confirmed to the Registers of Scotland that one such transaction was the ownership then sale of half a stake in Smeaton Farm (part of Dalkeith Country Park) from Pentland to Buccleuch Estate. Pentland also owns land near Canonbie, in Dumfries and Galloway, and signed loans worth millions of pounds in total to various Buccleuch subsidiary companies. Wightman, who compiled the research, said: “Transparency is one of the key issues for a world of global capital in which the wealthiest one per cent are not only getting wealthier but are able to conceal their affairs through the use of secrecy jurisdictions. “Since working on the Sunday Times Rich List 20 years ago and since the advent of the Scottish Parliament in 1999, the UK and Scottish Governments are only now beginning to appreciate the potential scale and impact of secrecy in how land and property is owned. A spokesman for the Duke’s estate confirmed Pentland Limited was a Buccleuch venture with interests in Scottish land. “Pentland Limited is a Cayman Islands incorporated vehicle which is wholly owned by The Buccleuch Estates Limited which is UK registered,” he said. “The company has always been wholly owned by Buccleuch and members of the Buccleuch family, all of whom are UK resident taxpayers. All profits arising in Pentland Limited are subject to UK corporation tax. The Duke, whose five estates cover an acreage larger than any other landowner in the UK, has been a consistent opponent of land reform and has been implicated in numerous community disputes in recent years. Last week the inherited estate announced plans to block access to Dalkeith Country Park at night unless walkers and cyclists paid for access. Buccleuch also faced a community backlash in Canonbie over plans for coal bed methane extraction. Buccleuch, one of the old aristocratic families that grew to dominate rural Scotland through historic land grabs, said he was ‘deeply dismayed’ that the land reform debate had been ‘re-opened’ in the past few years. Rob Gibson MSP, convener of the Rural Affairs, Climate Change and Environment (RACCE) committee that led scrutiny of the Land Reform Bill, said the new evidence demonstrated the need to use the Land Reform Bill to ensure future ownership transparency. Yesterday the RACCE committee published its legacy report for 2011-16, which signalled land reform efforts would continue through establishing a Land Commission. Gibson added that “the next committee will have a big job to do” to ensure that land ownership is transparent and any ongoing tax avoidance is identified. The scale of offshore ownership of land is estimated to equal 750,000 acres. As the national land register is incomplete, Scottish Government officials have been unable to confirm the scale of the tax haven problem. In January chief police investigators warned complex offshore ownership structures also created a bureaucratic nightmare for enforcing the law, specifically in relation to prosecuting the wildlife crime that took place on the Kildrummy estate. The police found it impossible to identify a legal owner of the land – held offshore in Jersey – despite three years of effort and ‘significant international investigations’. Nine months of negotiation between MSPs, campaigners and the government aimed to strengthen the Bill to ensure the greatest transparency for Scottish land registered in places like Cayman, the British Virgin Isles and Jersey. On Wednesday the Scottish Parliament will hear amendments to the bill from Patrick Harvie MSP, including proposals to tighten regulation on land owned in British overseas territories. Nicky MacCrimmon, who led land reform campaigners to victory at the 2015 SNP conference, called for the government to end tax haven ownership by rich landowners. He said: “It is not just a question of tax revenue or potential money laundering. It goes to the heart of democracy by saying we demand transparency and accountability from the people who own and exploit our natural resources. The greatest opposition to land reform has come from the lobbyists for big landowners and their legal representatives. Legal firm Brodies warned the Scottish Government that land reform action could lead to a court challenge and high compensation claims from landowners. Socialist coalition Rise has called for Scotland’s aristocracy to be confronted through ‘a campaign of protest’. The ownership of land in Scotland has also caught the attention of tax justice campaigners, who oppose the web of ‘secrecy jurisdictions’ where an estimated $7.6 billion of global wealth is stored offshore. Alex Cobham, director of research with the Tax Justice Network, said: “There’s no good reason not to know who you’re doing business with, so any time you come across such complex and opaque ownership arrangements, you have to ask what the reason is. The irony here is that it relates to the ownership of the most tangible assets imaginable: the land itself of this country. “The UK Government has played an important role in the fight against anonymous company ownership, but there’s a very long way to go – and it starts with addressing the biggest global financial secrecy network, which is of course made up of the UK’s own Overseas Territories and Crown Dependencies. When David Cameron hosts his international anti-corruption summit in May, the item at the top of the agenda must be to require every one of these jurisdictions to commit to public registries of the beneficial ownership of companies, trusts and foundations. The Cayman Islands, where Buccleuch’s Pentland Limited firm is based, were condemned by President Barack Obama for undermining global tax rules. Cayman, a British Overseas Territory, has no direct taxation and is used by many of the world’s largest corporations to avoid tax. One Cayman building, Ugland house, is the registered address of nearly 20,000 global firms. Further controversy over business activity in tax havens coincides with the release of a new report from charity Oxfam titled Ending the Era of Tax Havens. LORD DARLINGTON was adamant. The two young German maids would have to go. Miss Kenton, the housekeeper, was close to tears as she explained that they would have to return to Germany, a terrible risk considering both were Jewish. But his lordship remained unmoved. He believed in appeasement towards Nazi Germany and the employment of Jewish people was ‘inappropriate’. Although fictional, there is a bitter ring of truth about this scene – featuring James Fox and Emma Thompson – from the 1993 film The Remains Of The Day, based on Kazuo Ishiguro’s novel. The Lord Darlington figure was typical of a formidable group of British peers who were attracted by Hitler and supported efforts to keep the dictator placated. A new book, Aristocrats by Lawrence James, includes material on such ardently Right-wing and anti-Semitic aristocrats and how their vile attitudes brought considerable satisfaction to Hitler. They all saw an immensely powerful union between Communism and the Jewish people as a world conspiracy that could be thwarted only by Fascism. Both Hitler and his strutting Italian cohort Mussolini offered these bewildered aristocrats a safe world that would be secure from any Communist takeover. It also confirmed their long-held private prejudice. What made such hatred additionally odious was the fact these peers continued to air their views long after Hitler’s persecution of Germany’s Jewish population had become widely known. Brocket, said to be ‘a fundamentally nice but stupid man’ even deluded himself that he was a valuable link between Hitler and Britain’s leaders. It was suggested that he lit fires on his Hertfordshire estates to guide German bombers on their way to London. Another pro-Nazi peer was Lord Redesdale . His daughters, who became famous as the literary Mitford sisters, included Unity who went to Germany and stalked Hitler, having fallen in love with him. Although she did become close to Hitler – he considered her to be a ‘perfect example of Aryan womanhood’. He told her to return to England as war approached. She shot herself in the head in Munich’s English Garden but survived and was dispatched home. Another admirer of Hitler was the Duke of Westminster, a man who believed countless conspiracies among British Jews to subvert the country. He even spent the first year of the war demanding, to whoever would listen, that peace be made with Germany. One of the most colourful ermine-clad extremists was the 22nd Earl of Erroll, the Casanova of Kenya’s debauched Happy Valley set. After being mesmerised by Hitler, this devastatingly handsome man promised to introduce Fascism to East Africa. This included a self-supporting empire that would not ‘trade with the dirty foreigner’. Among the most famous names associated with anti-Semitism was the fifth Duke of Wellington . He became a member of the secret Right Club, which attempted to unify all pre-war Right-wing groups in Britain. One Hitler-admiring peer, the Duke of Buccleuch, was even close to King George VI as the Lord Steward of the Royal Household. He also accompanied Lord Brocket to celebrate the Fuhrer;s 50th birthday. It was a matter of personal delight to Hitler that the duke, a man who served in the very court of Britain;s Royal Family, was there . Buccleuch was opposed to any war with the Nazis and when it did break out in 1939, he joined the Peace Aims Group and urged a truce based on Germany keeping all the lands Hitler had stolen in Europe. Even after the bombing started, he continued to defend Hitler. A continuing embarrassment to the King, he was sacked in 1940. One of the most alarming figures among this cabal was Lord Londonderry – Winston Churchill’s cousin and a member of one of the country’s wealthiest aristocratic families. The king called him ‘Charlie’ and other members of the Royal Family were frequent guests at his London home, as were major political figures. He regularly visited Germany, met Hitler several times and even stayed with Goering at his hunting lodge. But he was not taken seriously and Churchill referred to him as a ‘half-wit’. He was known in the press as ‘the Londonderry Herr’ for his pro-German leanings. One of the best-known figures was Sir Oswald Mosley, founder of the Blackshirts and a man who yearned to be Britain’s own ‘Fuhrer’. A highly charismatic man , he was deeply impressed by Mussolini and founded the British Union of Fascists. I once interviewed him at his ‘Versailles home and over lunch, at which Lady Mosley (one of the Mitford sisters) was present, we discussed the Holocaust. But towering over all these figures were the Duke and Duchess of Windsor. He had abdicated as King Edward VIII in 1936 in order to marry American divorcee, Wallis Simpson. They were later given the ducal titles . Their admiration for Hitler concerned the government, particularly after they were entertained by him on a visit in 1937. Even the Americans were alarmed – the FBI sent a memo to President Roosevelt stating that the duchess was ‘exceedingly pro-German in her sympathies and connections’. The Duke was given the wartime job of governor of the Bahamas and ‘Roosevelt ordered the FBI to follow them when they visited the US. It was believed that Goering had concluded a deal with the Duke to install him on the throne after Germany had won the war. His court would, no doubt, have comprised many of those pernicious peers who had lauded Hitler so lavishly. Firstly , a big thank you for all the support and solidarity, not just for yesterday but for every action taken by all to keep this land occupied, the community informed and having empathy for this cause. Yesterday morning around 10am court bailiffs, private security, builders with bulldozers and Brian Bennett arrived on site followed by a police presence and took hold of y.c.c.f, tearing people out of their homes and dragging them out onto the road, there was no time to gather all belonging and most have been destroyed by Bennett’s team. Bennett’s team smashed van windows, stole money, security dogs attacked and bit, worst of all buildings and homes have been crushed to rubble by diggers, burying piles of homes, the farm now looks like a land fill. Trees were torn out of the ground to crush the tree houses, its a really sad situation, soul destroying. Four cats have been lost in the chaos and a chicken. We are trying to get them back, the dogs and rest of chickens and cockerel are safe and sound. The police have said that a briefing between them and Bennett’s team clarified the way the eviction was to be dealt with, they were not allowed to destroy any buildings with possessions in. However they destroyed every building apart from the main hanger. The few people who argued their way back in, collected what possessions they could from the rubble. No documents were showed by any authority at any time and court bailfs signed the possesion over to bennet whilst the land was still in occupation by at least four y.c.c.f occupants. Over night more have gathered in the hanger and back woodland, please support, come stay even for a night or if you can bring food, tents or blankets/sleeping bags. This is not over, y.c.c.f are still in occupation of the land. Site number is 07522 025889. Directions to safe entry woodland camp at rear of site. Look on map and be creative. 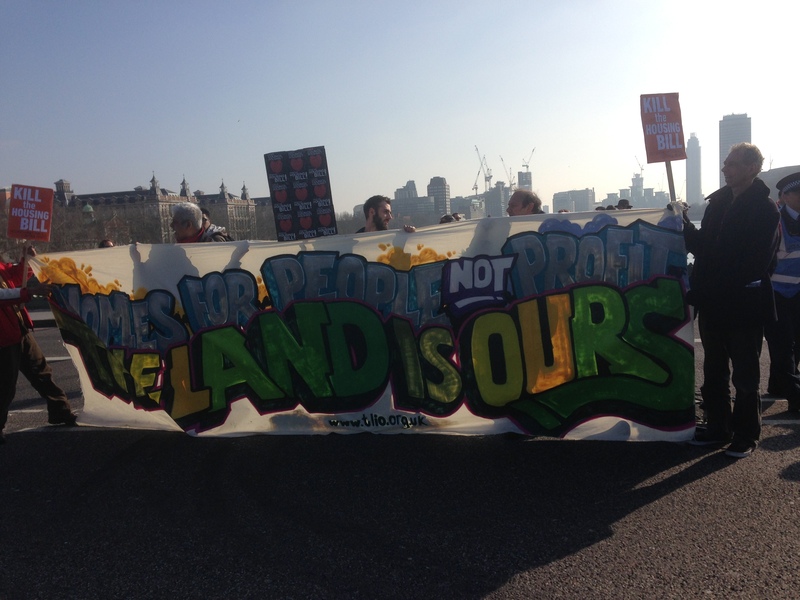 Organised by Kill the Housing Bill: https://killthehousingbill.wordpress.com. The government are in the process of passing a legislative bill through Parliament called the “Housing and Planning Bill”. At the heart of this legislation are ‘Starter Homes’ – targeted to boost the grossly-inflated housing market designed to transform ‘Generation Rent into Generation Buy’ by providing discounts of 20% to first-time buyers which at 4/5ths the market price will still be unaffordable to many (calculations for London demand an ‘ income of £77,000 and a deposit of £98,000). For council housing tenants, the bill requires councils to change how they charge tenants with a combined income of more than £30,000 outside of London and £40,000 in the capital. Under the so-called “pay to stay” measures, tenants will be charged the same level as the private rent sector, which could force thousands of people from their homes. The ‘Planning’ component of this bill sets in motion a complete overhaul of the planning system primarily to give housebuilders more freedom to build more houses whilst at the same time diluting the definition of “affordable housing”, combining with the ‘Housing’ aspect of the bill to boost the housing market with measures such as expanding right-to-buy to housing association tenants and ‘Starter Homes’. However, the ‘Housing’ component of this bill also makes fundamental changes to social housing, including making tenancies less secure, and together with extending “Right-to-Buy” to housing association tenants in a massive sweeping way, forces the sale of high-value council homes – changes which will further shrink social housing and further expand the “Buy-to-Let” housing sector and private rental sector. The Housing and Planning Bill was introduced to the House of Commons on 13 October 2015. It had its second reading on 2 November 2015. The Bill passed Third Reading on 12 January 2016 and goes through the House of Lords before it can get final assent in Parliament. As many as 65 amendments were tabled and added onto the bill at 3rd Reading in the House of Commons, including replacing secure tenancies with fixed-term tenancies and allowing councils to “contract out” the processing of planning applications. That there is a shortage of affordable housing is obvious. The campaign group Defend Council Housing point to the reason for this as having been the “chronic under-supply of new homes, particularly affordable homes for rent”, citing the steady decline in the rate of new house-build over time since the early 1970s including particularly the decline of new council housing which is now next to nothing after being 50% of total new housing stock in 1970. A rise in the “Buy-to-Let” market, an explosion in bank credit in the 1990s and a gradual long-term shrinking of the social housing base because of the long-term dwindling of council housing stock have been the main factors which have combined to create this affordability crisis in England – especially southern England – of high house prices and high rents. With property increasingly attracting foreign investors, especially in London, and the “Buy-to-Let” market continuing to expand, the house-price spiral has further accelerated. As a result, as well as a rental affordability crisis, the proportion of the population in home ownership is starting to dip as new entrants struggle to afford to get on the property ladder. The Tory government’s solution to the crisis has developed over the last year. Their plan is to spark demand in the mortgage market in this sea of unaffordability through subsidising new entrants for owner-occupation to get their first step on the housing ladder through a new “Starter Homes initiative”, to encourage right-to buy by housing association tenants, and on the supply side, to free up the planning system to housebuilders, small and large. Public sector assets (council homes) will be sold off, with councils forced to sell-off high-value council homes when they become empty, with proceeds from sales unlikely to be ploughed back into more social housing as the bill will formally require councils to subsidise Housing Associations’ Right to Buy discounts up to £100,000, with no guarantee of replacement homes at similar rents in the same area. In their plans, council housing is considered only at the margins, reconceived as a resource to be utilised only as a safety net for the very poorest in society, whilst remaining poor and low-income working population are consigned to being accommodated through social housing within housing associations, where rent is marginally discounted, or in the private-rental sector, where rents are high. The existing and future Social Housing stock will shrink under these plans because there will be no statutory obligation on housing associations to provide like-for-like quantitative replacement social housing in regard to right-to buy purchases of social housing by housing association tenants, so reducing the total stock of social housing. The long term trend of the shrinking social housing base and transfer of rentiers into the private sector rental market has increased the housing benefit bill, which has risen by £650 million a year since 2009-10 (for 2013/14 it was £24.6 billion and is expected to reach £27 billion by 2018/19). The bill will remove secure tenancies and replace them with 2-5 year fixed-term tenancies, after which tenants would have to “reapply”, with means testing and ‘Pay to Stay’ deals if household income reaches above £30,000 (£40,000 in London), radically undermining the stability of mixed communities. Relatives living with a tenant would lose their right to remain and take on the tenancy if the tenant dies or moves away. The Housing & Planning Bill will amend planning legislation to give priority to its new Starter Homes initiative. This is a programme of funding for developers to provide “starter homes” at 80% market price. The value thresholds for starter homes in London will be £450,000 and in the rest of England £250,000 – prices which are not affordable by many middle-income households and certainly not by lower-income households. In effect, what the government is doing in promoting a specific developer product – starter homes at 80% of average market price – over and above other more affordable housing products, is both unprecedented and contrary to the basic principle of evidence-based planning. The government is geared to imposing starter homes targets on individual local authorities so that it delivers its national 200,000 starter homes target by 2020. A new clause introduced into the bill contains a new definition of affordable housing. It defines it as “new dwellings in England that are to be made available for people whose needs are not adequately served by the commercial housing market”, bringing Starter Homes within the definition. The National Planning Policy Framework consultation proposal is to “amend the national planning policy definition of affordable housing so that it encompasses a fuller range of products that can support people to access home ownership …This would include products that are analogous to low cost market housing”. So ‘affordable housing’ is being redefined within the confines of the market, a market which even at 80% of market price particularly in London is financially out-of-reach to large sections of the population, especially younger generations. The central measures in the Housing and Planning Bill propose key changes to the definition of planning permission, creating a new definition of “Planning Permission in Principle” with “technical details” (such as built form, density, bedroom size, access, social infrastructure and flood mitigation measures) ironed out after initial consent is agreed in principle, a new planning framework which seems to earmark a more robust, flexible and efficient planning system that better responds to the economic environment. However, the difficulty here is that policy compliance on “technical details” are critical matters within any consideration of a planning application and they cannot be checked at the “in principle” stage, and once “in principle” consent is given it is unclear to what extent planning authorities can impose their key policy requirements. The government is also introducing a mechanism by which the government minister can issue a local development order for a site or group of sites which in effect determines planning policy and grants planning consent for developments, irrespective of the policies set out in adopted local plans. While ministers have stated that the use of these powers will be limited to small sites or to sites on the council’s brownfield register (another new requirement), the bill itself contains no such limitations. This Housing and Planning Bill undermines social housing provision across England and Wales whilst acting as a charter for developers and the big housing corporations to expand their growth, allowing them to reap structural changes to planning law that facilitate new housing development underpinned by structural changes to local government that guarantee financial subsidies to discount new house build paid for through the sale of high-value council homes. This bill will also create centralised government control and developer-led privatisation of parts of the planning system. It is not only fatally flawed, but fundamentally disastrous, will increase the displacement of vulnerable communities and elevate eviction rates. This bill is not a solution to a housing crisis; it will intensify the housing crisis. It must be opposed! A group of hunter-gatherers who have been living in a commune in the woods for 16 years are facing eviction after being refused planning permission for their makeshift homes. The Steward Woodland Community, which has 21 residents, including nine children, live in homes in rural Dartmoor, Devon, which they built themselves using timber and recycled materials. Their alternative self-sufficient lifestyle includes foraging for food, using solar powered electricity and alternative medicines. But despite living there since 2000, the Dartmoor National Park Authority has refused permanent planning permission for their homes and ordered them group to leave. ‘It’s hard for people to understand unless you have lived closely together with community and family like we do. The community purchased Steward Wood, near Moretonhampstead, Devon, at the turn of the millennium. The Woodlanders try to live sustainable lives by using renewable energy – including solar panels – and growing their own fruit and veg. Most of the children are also home-educated but are friends with people from the surrounding villages. They use running water. They have twice secured temporary five-year planning permission. But their request to stay permanently has been rejected. A crowdfunding campaign has now been launched to raise the £38,000 needed to launch a legal challenge against the planning decision. They have already managed to raise £22,808 and have received 406 letters of support. Dr Tom Greeves, chairman of the Dartmoor Society, a group that aims to promote the wellbeing of the area, is among those backing their cause. He said: ‘We admire the tenacity and dedication over 15 years of this small group of men, women and children who have opted for a very different lifestyle to that enjoyed by most of us. But, ahead of the application decision, there were 19 letters of objection sent to the authority, with one of their neighbours, Karen Thwaite, saying their lifestyle is not ‘valuable’. But, despite the opposition, the group remain hopeful. Melanie Davis, 36, a teaching assistant at the local school who has lived in the community for 10 years added: ‘It’s [leaving the woodland] is not something I have put my energy into thinking about. The development management committee of the Dartmoor National Park Authority said the application had been refused because of the ‘harmful effect’ that the camp has on the ‘character and appearance of the National Park’. They added: ‘Another area of concern was the lack of consideration for European Protected Species, three of which are present either on the site or within the area, namely Otters, Hazel Dormice and woodland Bats, particularly the Greater Horseshoe Bat. The statement added that the Steward Woodland community was ‘experimental’ and any development in the countryside needs to be essential and ‘sustainable over the longer term’. A planning inspector is due to hear the case next month.